Fun puzzles for young ones! Completed size is 6-1/2" x 5"
Each jigsaw puzzle features an assorted wild animal and contains 24 pieces. Designs may vary. Completed size is 6-1/2" x 5". Pack of 12. These weren't a gift For me but I put these in 3 shoeboxes I packed for the organization Operation Christmas Child. I love to pack shoe boxes for Operation Christmas Child. 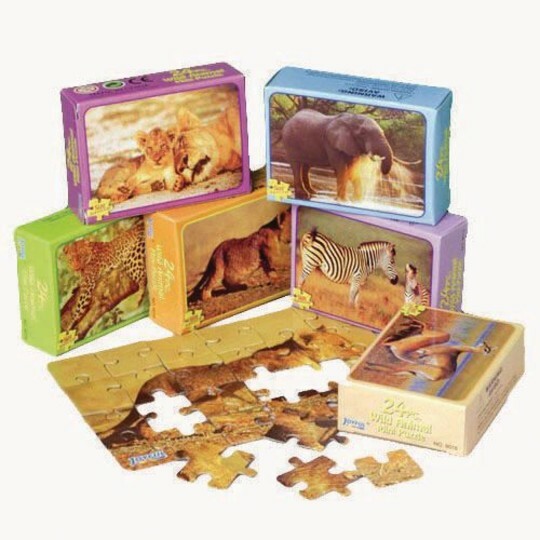 The only thing I would change is I wish the products had an option to get 1 if 1 of such an such item like 1 puzzle is all you need at that time. Part of Sunday school Birthday presents.